The Honda VTX 1300R & 1300S fairings attach with no modifications or drilling. On all other Honda VTX models 1300 (C, N) you must drill ¼” hole in the bottom triple tree. Use ¼" drill bit to drill on triple tree. The Installation Instructions contain images detailing the installation process for the Memphis Shade brackets. Please use 2 washers under the brackets for shims. Our brackets mount on the inside of the fork tubes, not on the fork tubes. This is why the Memphis Shade brackets come with the fairing. There is no detachable access panel on this fairing because it contains a built in glove box. 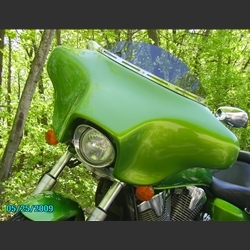 On all Honda VTX models 1800 (C, N, R, S) you must drill ¼” hole in the bottom triple tree on these models. Use ¼" drill bit to drill on triple tree. The Installation Instructions contain images detailing the installation process for the Memphis Shade brackets. Please use 2 washers under the brackets for shims. On 1800’s models you may need to shim down with washers 3/8” to put the fairing closer to headlight. This may require 3-4 washers. VTX 1800 Spec 2 or Spec 3: If it has chrome forks, and if the running lights or turn signals won’t move down, it will not work.